Back in the day, and by that we mean the late 80s and early 90s, arcade machines started using the JAMMA standard, a means for a single arcade board to be wired in to the controllers, video output, and other ephemera found in arcade cabinets. Since then, quite a few people have amassed a collection of these vintage arcade boards. Putting them to use requires a means of providing power, video output and controller connections. 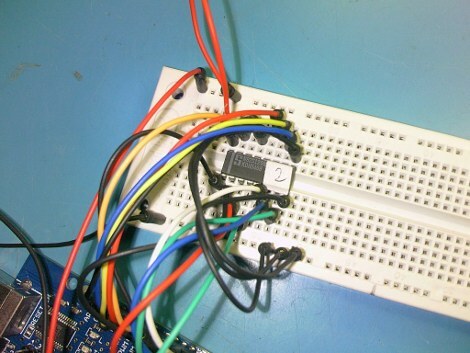 The usual way of wiring in a joystick and buttons is with a wiring harness, but [Mike] and [Jasen] are connecting Xbox 360 and PS3 controllers to their machines with the help of a Raspberry Pi Hat. [Mike] and [Jasen] created Project Kajitsu to replace the expensive ‘Supergun’ controllers arcade game collectors usually use to play Street Fighter, X-Men, and Battletoads. They’re using the USB ports on a Raspberry Pi B+ to listen to two XBox or PS3 controllers and translate button mashing into something these old games can understand. The guys are using a custom Linux Kernel that boots in just a few seconds, providing the bare minimum of an OS to support the controllers. The board itself is extremely simple; just a few bus transceivers, caps, resistors, and headers. They have an iPhone-quality vertical video proof of concept video (below), and although they’re still figuring out the best way to simplify the Bluetooth pairing process, they’re well on their way to supporting wireless controllers. This board only provides controller input. If you have one of these old boards, you will need video output. That’s another project entirely, but very simple if you have an SCART monitor. A few decades ago, Japanese manufacturers of arcade games realized they should make a connector for all their boards that provides the power, controller, video, and audio I/O. This became the JAMMA standard and it make arcade owner’s lives awesome. Because you can buy arcade boards off the Internet, arcade enthusiasts figured out they could build their own console with an ATX power supply, AV connectors, and a few controllers. These ‘superguns’ as they’re called are big devices with wires all over the place. [Charlie] wanted to condense the size of his supergun and ended up creating a single PCB solution. The JAMMA compatable boards require a few power connections; +5 V, +12 V, and -5 V. Of all the boards [Charlie] has collected so far, he realized only one used the negative supply. This, along with a big 12V laptop power supply, means the only power connection for this mini supergun is a single barrel connector. For the controls and A/V, DSub and SCART connectors are commonplace. Laying these parts out in Eagle resulted in a single-sided board that is easily fabbed by etching with a toner transfer at home. There are a few problems with the build, as [Charlie] admits. Some of the pins on the JAMMA connector aren’t on the board. These are only ground pins on the pinout, and so far everything works okay. It’s still a great project, though, that turns old arcade boards into a playable device with a minimal amount of hardware. We’re guessing that if you ever though of buying an arcade cabinet it was only briefly, and you decided against based on the difficulties of moving and finding a place for such a large and heavy item. You could go the opposite way and build a controller for a MAME box, but for some, there’s no replacement for the real hardware. 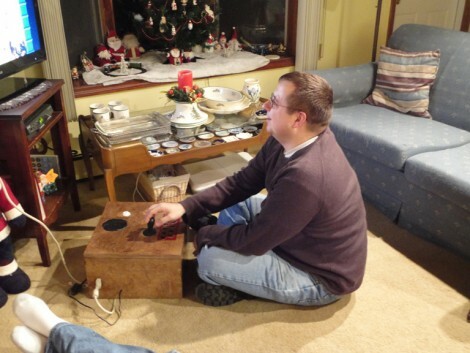 This Christmas gift is the best of both worlds, a JAMMA box which uses traditional hardware in a more compact cabinet. [Majtolycus’] boy friend is a sucker for a game of Battle Balls. She looked around for an original logic board and after several weeks of searching had to settle for the Japanese version of the game called Senkyu. To patch into the board she also picked up a JAMMA harness, power supply, RGB to VGA video converter, speaker, and some Happ arcade controls. The whole thing goes into a wood box which connects to a VGA monitor (or the VGA port on your HDTV). The system is easier to store than a full-sized cabinet, and if a deal comes along, you can buy additional JAMMA logic boards to play.